If you’ve been following the goings-on with the many betas and preview releases Apple currently has running, you will certainly have caught wind of the security breach to the Developer Program last month, which saw significant downtime and disruption to services. After almost two weeks of nothingness, the system was finally restored enough to resume near-usual service, and now, a month on from the initial problem, the whole program has now been officially reported as back on track. Although the security issue, which has prompted Apple to overhaul the back-end of the system, doesn’t appear to have had a massive effect on the progress of the unreleased software, the whole fiasco certainly disrupted many developers signed up to the program. In an attempt to redeem users for the inconvenience, Apple will be extending all current Developer accounts by one month, meaning although the lost time cannot be brought back, at least those signed up won’t be losing any money due to the massive, security-shaped hole in their annual fee. 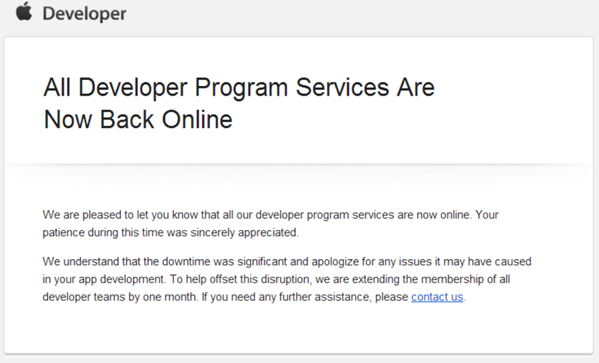 The Cupertino has sent out emails to all registered developers notifying them of the completion of system repairs, as well as the one month auto add-on. The correspondence also thanked users for their patience, going on to issue an apology, and with many changes made to prevent this kind of security breach from repeating itself, let’s hope we don’t see anything like this again. 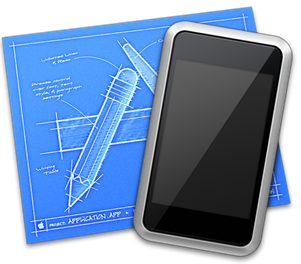 With so much important software, notably iOS 7, reliant on the Dev Center as a means of updating and improving the functionality ready for release, the last thing Apple needs is another hiccup of this kind. The company has made many more visual changes to its iconic mobile firmware compared with the previous six iterations, and with plenty of fans still needing to be sold on the flatter, brighter overall aesthetic, let’s hope the Dev Center can once again be the reliable a service we’ve always presumed it to be. With five betas already clocked up and counting, it won’t be too long now before iOS 7 is ready for prime time, and if what we’ve been hearing recently holds any truth within, we could be treated to a plethora of new iOS devices to accompany the heavily-modded firmware.